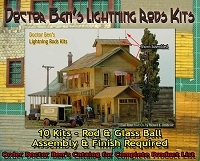 Each package of Doctor Ben’s Lightning Rods contains ten (10) rods and ten (10) glass balls. In that the design and installation varied of these devices the materials provided to you enables you to determine the design of your preference. The first (and easiest) installation is to slide the glass ball onto the brass pin to all the way to the head of the pin (SEE Image 1). Use just a small drop of a CA glue (white glue will work, but requires much more time to set up) to affix the glass ball to the rod. Now all you need to do is decide how many lightning rods and where on your roofs to place them. When you have figured this out a very small drop of CA glue to the head of the pin and a shot of kicker will set the lightning rod in place very quickly. The second installation (SEE Image 2) is to remove the head of the pin with a set of flush side cutters or a track saw and slide the glass ball about half way down the rod. No with just a spot of CA glue affix the glass globe to the rod. Now drill or poke a very small hole where you want the placement of the lighting rods and again with a very fine drop of CA glue and a shot of kicker you now have a lightning rod installed on your structure. Some folks like to leave the shiny brass rod alone and that is okay. But realistically, farmers, factories and many others just used metal rods which many times were bare, common steel—that always rusts. I prefer this look because it gives me another reason to have rust running down the roof for additional detail. You can always us the Doctor Ben’s Industrial Pigment #1132 Dark Patina to create that green look from brass, bronze and copper that washes off over time. As for the glass ball, you can leave them alone and green or make them any color you would like. The glass balls we often light blue, red, clear, and are considered collectables nowadays that sell for $15 to $55. It was in Boston, Massachusetts, in 1746 that Benjamin Franklin first stumbled upon other scientists' electrical experiments. He quickly turned his home into a little laboratory, using machines made out of items he found around the house. During one experiment, Ben accidentally shocked himself. By 1750, in addition to wanting to prove that lightning was electricity, Franklin began to think about protecting people, buildings, and other structures from lightning. This grew into his idea for the lightning rod. 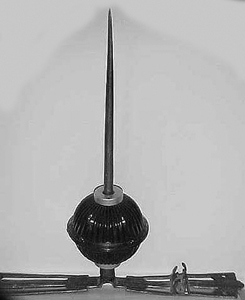 Lightning rod with glass balls have long been part of the American rural landscape. Some were made as early as 1840. 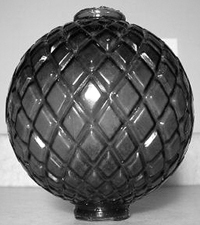 They were originally sold as decorative ornaments for lightning rods and are found in a wide range of shapes and colors that also served to provide visual sign of a lightning strike (when the rod is struck the glass ball shatters and falls off, indicating to the owner which rod got struck and that they should chec k it and the grounding wire for damage). The glass balls were usually about four and a half inches in diameter. 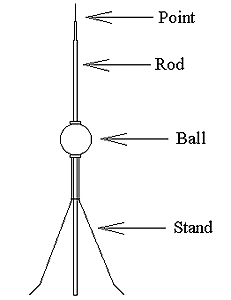 There are some 34 shapes or styles of lightning rod balls. The balls were sold by salesmen going from farm to farm in horse drawn wagons from 1870 until the Great Depression closed businesses. 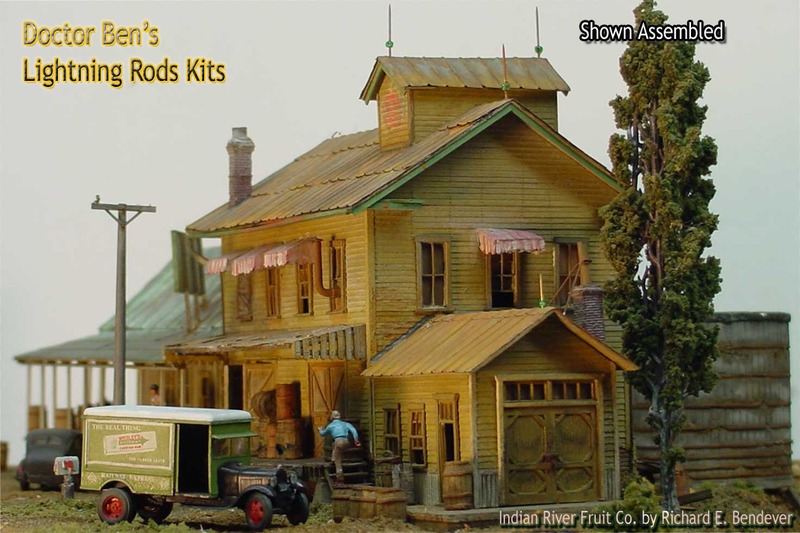 You will find lightning rods on the roofs of barns, homes, businesses, tall smoke stacks, chimneys, factories, church steeples, lighthouses, coal facilities, tall wooded bridges and so many more places!